**Alexander Smith** (1830-1867) was born in Kilmarnock to a lowlander John Smith and highlander Murray Smith. He was part of the Spasmodic School along with other poets such as Sydney Dobell and P.J. Bailey, whose works were notable for their rapid rise and fall from fame. These Spasmodic poets were associated for their writing traits of lengthy, displaced imagery, odd themes and dark poems.He worked in the linen factory since he could not afford college, before he started writing poetry. His earlier poems, A Life in Drama and other Poems (1853) which appeared in the Glasgow Citizen, was well received. However, the morality of the spasmodic poetry was later questioned by critics, especially the one whereby the hero raped a girl who is in love with him. The publication of City Poems (1857), which contained the poem Glasgow”, was slightly more successful. However by then, Smith was much belittled in his work and even accused of plagiarising the work of Tennyson and Keats. He married Flora Macdonald from Skye in 1857.Inspired by the event in Crimean War, Smith also worked with Sydney Dobell, his good friend, to produce a series of sonnets known as War Sonnets (1855). Later, Smith was so harshly mocked through the work of WE Aytuon’s parody of genre, Fimilian (1854) that he never recovered from the spasmodic label. Edwin of Northumbria Edwin of Deira (1861) was believed to be Smith last set of poems published. 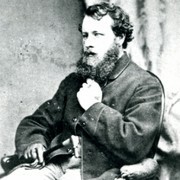 He then turned to writing prose such as Dreamthorp: Essays written in the Country (1863), A Summer in Skye (1865), Miss Dona M’Quarrie and Alfred Hagart’s Household (1866). Though his proses received more encouraging words from critics, Smith, however, never enjoyed writing proses as much as he did for poems. He later died in Wardie, near Edinburgh.**References**:1. 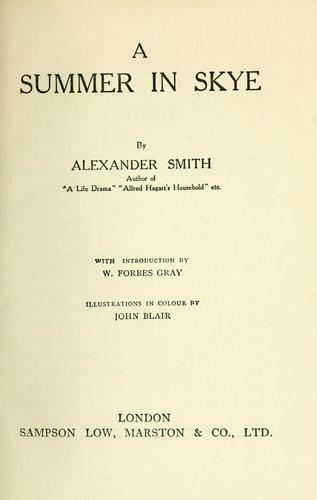 Smith, Alexander. - Poems, Book, and Life. 9th Edition of Encyclopedia Britannica, n.d. Web. 12 Nov. 2012. .2. Swinburne's spasms: Poems and Ballads and the 'Spasmodic School'. The Free Library. N.p.. Web. 12 Nov 2012. .3. Dobell, Sydney. 9th Edition of Encyclopedia Britannica. N.p.. Web. 12 Nov 2012. The Get Book Club service executes searching for the e-book "A summer in Skye" to provide you with the opportunity to download it for free. Click the appropriate button to start searching the book to get it in the format you are interested in.